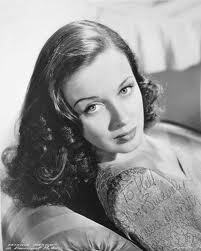 Gale Storm and Patricia Morison are two actresses I've been enjoying quite a bit in the last year or two, so when I heard they costarred in a movie I was intrigued. 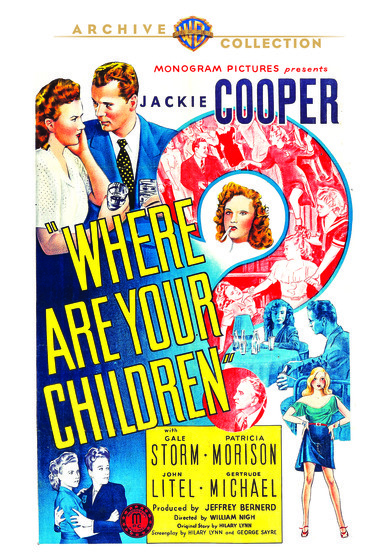 WHERE ARE YOUR CHILDREN (1943) is a Monogram programmer available from the Warner Archive. Storm plays Judy Lawson, a young girl who works at a diner. She meets wealthy Danny Cheston (Jackie Cooper), who takes her dancing, but unbeknownst to Danny and Judy, his "friends" spike Judy's drink. The tipsy Judy ends up being escorted home from the date by Linda Woodford (Patricia Morison), a juvenile officer who tries to steer young people onto the right track before they end up in serious trouble with the law. 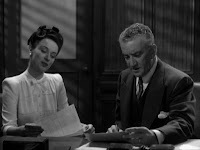 Judy sleeps in the front room in her brother's house; her brother (Anthony Warde) is sympathetic but his wife (Gertrude Michael) is a harridan who hates Judy and thinks the worst of her. Matters go from bad to worse when Judy's sister-in-law sees a letter from Danny, who has joined the Navy, and assumes the worst about Danny and Judy's relationship, kicking her out of the house. WHERE ARE YOUR CHILDREN is an engrossing film about a misunderstood young girl who is a victim of both circumstances and a lack of support at home. Her problems are compounded by the fact that Danny cares about her -- as evidenced by his reminiscing about her while a Navy pal (John Laurenz) sings a lovely rendition of "Girl of My Dreams" -- but he thinks encouraging her to have ideas about a future relationship is wrong since he's shipping off to war. Danny telling Judy they don't have a future is the emotional last straw for her, unless her brother, Linda, and a thoughtful judge (John Litel) can straighten her out. Storm does a good job portraying a confused young lady who virtually every character acknowledges is "a nice girl but..." Lacking much love at home, her heartbreak over the rejection by Danny, her only "safe haven," is palpable. Cooper is also good as a young man who isn't perfect -- he's obviously out dancing with the wrong crowd -- but who is trying to do the right thing as he sees it, including not allowing his "connected" mother to pull strings and get him an officer's commission. 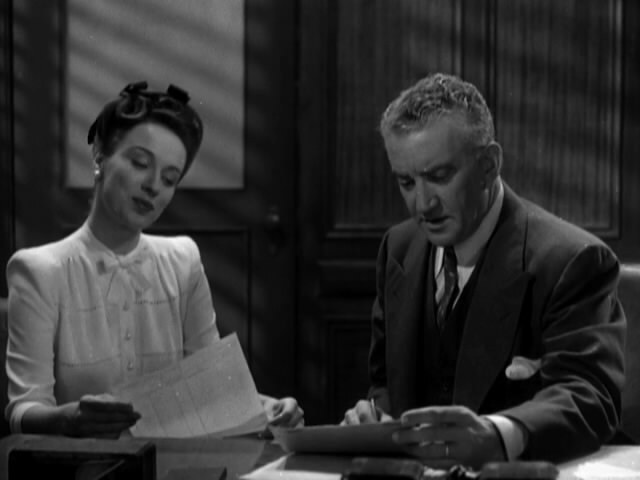 It was interesting seeing Morison playing a very idealistic character, just a few years after her chilling performance as a hardened criminal in PERSONS IN HIDING (1939), which I watched almost exactly a year ago. There's an interesting tie-in to the war as Linda points out to community leaders that if juvenile delinquency is unchecked, it will not only hurt the young people and the town, it will provide propaganda for Hitler! It's also mentioned that wartime conditions, with both parents working long factory shifts, lead to young people being unsupervised. It's a darker homefront story than we usually see in films of the era. WHERE ARE YOUR CHILDREN runs 73 minutes. It was directed by William Nigh and filmed by Ira Morgan and Mack Stengler. 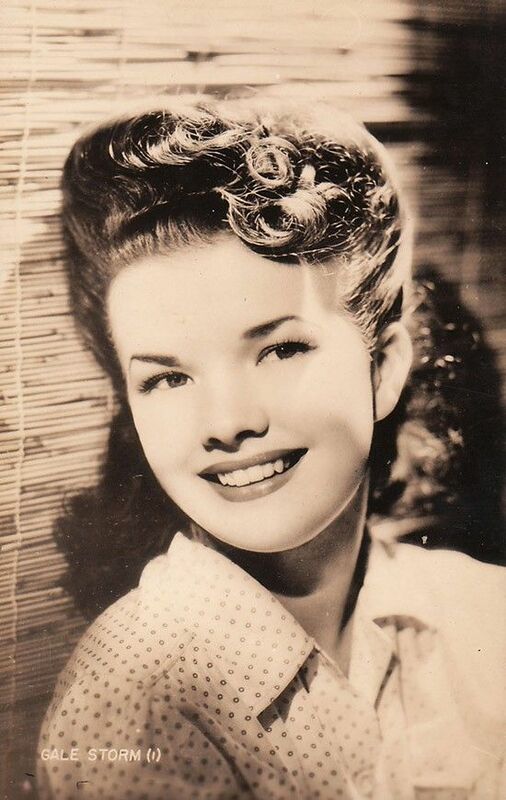 The screenplay by Hilary Lynn and George Wallace Sayre was based on a story by Lynn. The following year Nigh and Lynn collaborated on a similarly themed Monogram film, ARE THESE OUR PARENTS? (1944) with Helen Vinson and Lyle Talbot. I'd love to see it! 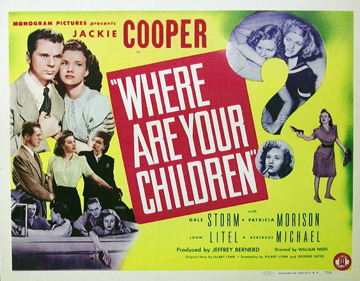 The supporting cast of WHERE ARE YOUR CHILDREN includes Addison Richards, Evelyn Eaton, Sarah Edwards, and Betty Blythe. As a note of trivia, although IMDb uses a question mark in the film's title, the Warner Archive DVD case is correct; the title card is simply WHERE ARE YOUR CHILDREN. The print is frequently "speckled," as also noted by Glenn Erickson in his positive review at DVD Savant. However, it does not detract from enjoying the movie. There are no extras on the disc. This was an interesting and rather different WWII-era melodrama with a good cast. I enjoyed it, and I'm very glad the Warner Archive has made it available. Because I'm somewhat of a pedant, I'm always intrigued by movie titles that ask a question, but the question mark is omitted on the title card of the movie. Another example of this is Shall We Dance (1937). that in PERSONS IN HIDING. Archive rescuing these obscure gems from the vaults. Mel, that's fun, I wonder how many other movies with "question" titles leave out the question mark? John, fun to hear that you also enjoyed this film. I agree, it's wonderful that the Warner Archive makes these previously hard-to-find films available once more.